22,300 miles above the Earth, an American signal-relaying satellite accidentally collides with a canister of radioactive waste (which was jettisoned into space by the Soviet Union) and the two fuse together on reentry into Earth’s atmosphere. 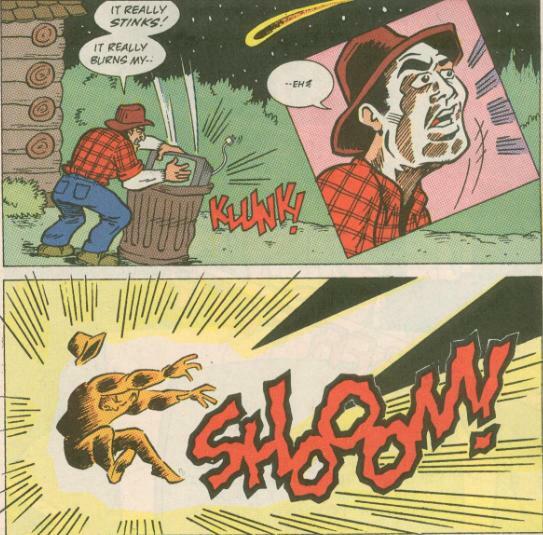 In a cabin out in the middle of nowhere, a plaid-shirted woodsman becomes so sick of the news about Earth’s rapidly decaying environment that he begins to throw his TV away. Then the satellite lands on him. Damn. The satellite, the toxic waste and the TV are all assimilated into the man, transforming him into a techno-freak named Vid Vicious. With a demented skull and crossbones on his torso-mounted TV screen telling him to do terrible things, Vid Vicious transforms into pure energy and vanishes. 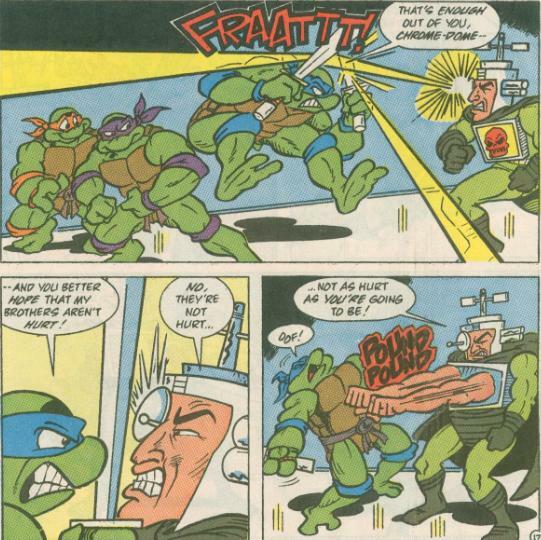 Down in the sewers, Mike, Don and Leo are busy sparring, though Leo is still worried about Raph and Mondo Gecko. At the newsroom building, Splinter is sharing a similar concern as April is busy doing research on Null. They’re interrupted by April’s coworker, Malcolm, who hasn’t seen her since she was taken hostage down in South America. After Malcolm leaves, April prepares to save her research when Vid Vicous appears on her computer monitor and yanks her into the…internet? I dunno. Splinter races back to the sewers and tells the Turtles of what has transpired. Don immediately hacks into the newsroom's computer network to see if he can trace the signal that abducted April back to its source. At a room in the Empire State Building, Vid Vicious is casually explaining to April what his plans are. He intends to briefly shut down all technology on Earth (including Mtv) in order to give humanity a chance to think about the horrible things they’ve done to the Earth, and he wants April to spread his message to the masses (how is she supposed to do that if he shuts down all technology?). Vicious then goes on to say that if the world doesn’t change its ways afterward, he will use the radioactive waste in his body to irradiate the world’s oil fields, making them useless and thus crippling all industry on the planet. April tries to tell him that his noble goals are ultimately misguided, as robbing the planet of oil will cripple hospitals, food supplies and other things we need, but he ain’t listenin’. Then the Turtles and Splinter smash through the window (how? This is the Empire State Building) and attack Vicious. After a brief skirmish, Vicious escapes into a computer monitor with Don leaping into the portal after him. Inside the machine, Vicious and Don continue their struggle. Outside the machine, the Turtles are faced with a very unexpected threat: the Shredder! Shredder orders his hordes of Foot Super Soldiers to attack. 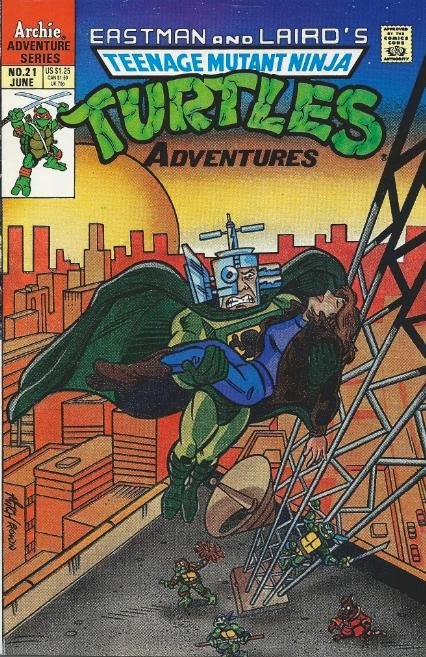 The Turtles, Splinter and April make short work of the robots, but they keep them busy long enough for Shredder to save all the data in the computer (Don and Vid Vicious) onto a floppy disk. Shredder then escapes out the window and into the night. *This story is continued from TMNT Adventures #20. This story continues in TMNT Adventures #22. *Raph and Mondo Gecko stowed away on Skul and Bean’s spaceship in Mighty Mutanimals (miniseries) #1. *April was taken hostage in South America in TMNT Adventures #14. *April's coworker, Malcolm, will appear again in April O'Neil #1. *April's news station is only referred to as "the newsroom" in this issue and not by name. By April O'Neil #1, both April and Malcolm will be shown working for station WRTL, instead of Channel 6. Whether the unnamed newsroom in this issue is Channel 6 or WRTL is uncertain, though the fact that Malcolm is employed there, too, would lean toward it being the latter. *Shredder was defeated and sent to prison in TMNT Adventures #13. *This issue was reprinted in the UK by Fleetway in TMHT Adventures #37. In the comic book industry, there is a thing called a “mort”. A mort is a villain, so poorly conceived, stupidly dressed and given the lamest powers and motivations that they’re regarded as being almost hilariously bad (think Orca the whale-woman from Batman). Vid Vicious is what you’d call a “mort”. While the TMNT regularly dealt with silly and over-the-top foes, those guys usually had some endearing or clever concept about them which made them enjoyable to some extent. Vid Vicious has none of that. As a matter of fact, his design was so stupid Playmates wouldn’t even make a toy out of him. As far as the story is concerned, Clarrain (Murphy) is back on top of his environmental soapbox. Boo. At least this time around he’s showing what danger environmental extremists are capable of, which sort of evens the bluntness of his message out a bit. You can hate Big Oil all you want, but if the world didn’t have fuel we’d be even worse off. The big event of this issue is the return of the Shredder. His grand comeback is sadly overshadowed by the woefully lame Vid Vicious, though it does come as a pretty shocking surprise, as he really just bursts into the story from completely out of the blue. 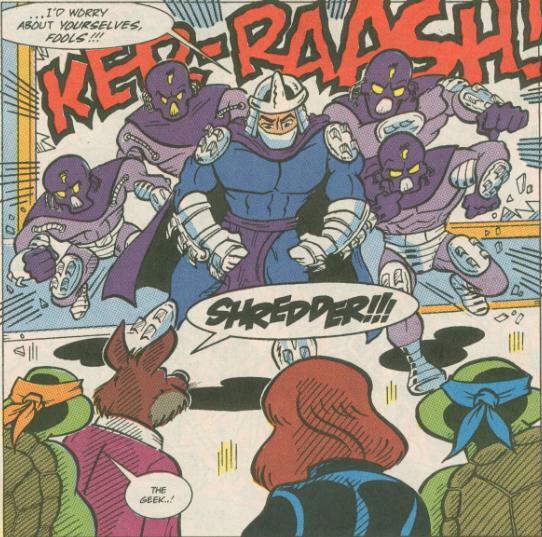 My primary complaint about Shredder’s return is that we got no explanation as to how he escaped from prison. No mention is made of his incarceration; he’s just out and about like it never happened. Of course, escaping from prison is likely child’s play to someone like the Shredder, but Clarrain could have at least acknowledged it to some degree. Overall, this isn’t an especially good issue, even with the grand return of the Turtles’ arch nemesis. TMNT Adventures is basically just plodding along until the Mighty Mutanimals miniseries is over and this issue makes it especially obvious.